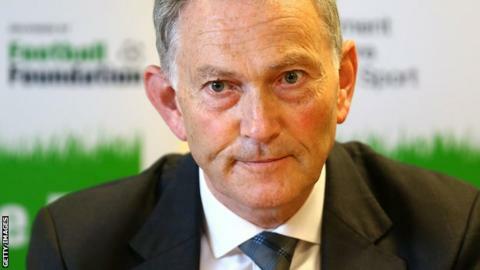 Premier League chief executive Richard Scudamore wants players and managers to be prevented from betting on football. Scudamore, speaking about match-fixing allegations that have surfaced in the last month, said he could not rule out the possibility that match-fixing had taken place in the Premier League. "If a person is involved in football, they shouldn't be allowed to bet on football," he told BBC Radio 5 live's Sportsweek programme. "The time has come for that to happen." Match-fixing and spot-fixing allegations have surfaced at various levels of the English game, from non-league football to the Championship. Blackburn striker DJ Campbell was one of six people questioned earlier this month - and then bailed until April 2014 - as part of a National Crime Agency (NCA) investigation into spot-fixing. Winger Cristian Montano, who was also questioned as part of the investigation, "vehemently denied" any involvement in spot-fixing after being sacked by League One club Oldham last Monday. Two footballers at Conference South side Whitehawk were charged with conspiracy to defraud earlier this month as part of a previous NCA match-fixing investigation. Scudamore added: "We have had 8,393 matches so far in the Premier League, and I can't actually sit here today and say it has never happened in those matches." He insisted the Premier League was doing all it could to target fixers, adding: "We are monitoring over 300 international betting markets and we have a whole system of things in place." But he admitted: "The one thing that scares you the most about this whole industry is the idea that integrity could be impugned in any way." He said he was confident that match-fixing was not "entirely widespread and prevalent", but added that it was still a "serious issue".